That’s right, Small Batch Cold Brew is back and we’re excited to offer you this deliciously bold and refreshing drink for the summer! Our Cold Brew is made with Guatemala medium roast blend that is naturally sweet, full bodied and nutty with hints of chocolate. What makes our Cold Brew different from any iced coffee drinks is that it is slow steeped in cold water for 16 hours. In fact, the brewing process lowers the acidity and preserves the rich flavour, resulting a stronger, more distinct taste. 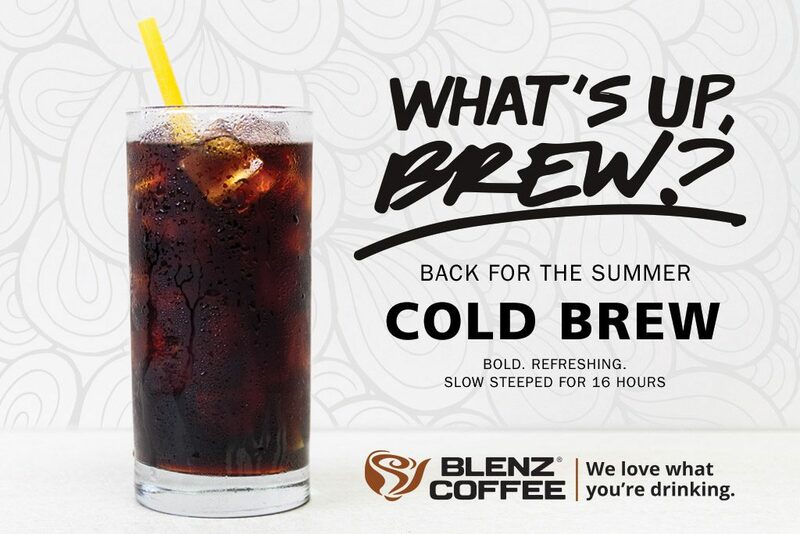 And if this doesn’t convince you enough, head over to your nearest Blenz Coffee to try it! You can have your Cold Brew black or modify it with your choice of milk – almond, soy, coconut or regular – and add a shot of flavour to enhance your drink. Small Batch Cold Brew is available starting today at your nearest Blenz Coffee, and you better hurry because this is only available for a limited time.